In the hospitality and travel industry, word of mouth is everything. In order to boost social media engagement, website traffic, and online reservations, you have to be proactive when it comes to getting people talking about your business. Word of mouth is the primary factor behind 20-50% of purchasing decisions. (Source: Extole). People are 4 times more likely to buy when referred by a friend (Source: Nielsen). 70% of consumers give more credibility to consumer-created reviews and peer recommendations than professionally-written content. (Source: Referral Rock). One of the best ways to boost resort awareness and get more people talking about your resort is by launching a contest or giveaway for your social media followers to participate in. Giveaways are an increasingly popular way for brands to reach their target audiences and capture qualified leads, and surprisingly, they tend to be fairly successful for most brands that invest in building, launching, and promoting them. Why? Because online consumers love free stuff. Who is my ideal guest? Who are my best and most loyal guests? What do my guests care about? What don’t my guests care about? What brands do they love? What kind of prize would grab their attention? Knowing these answers will help you decide what kind of prize to offer to your audience, and will make it easier to target the right people when you’re ready to promote your campaign. Prize Option #1: You offer prizes that only relate to your resort (a free night, a free meal, free shuttle, etc. Prize Option #2: You offer a small prize that multiple people can win (ex. You’re giving away twenty $10 Starbucks gift cards). Prize Option #3: You create a big prize package that includes a gift that can be redeemed at your resort PLUS other gifts from brands you know they love. In this option, you’re investing much more money in the prize, so you only allow 1 or 2 people to win the prize. The option you ultimately choose will depend on your budget and your personal preferences, but keep in mind that option 3 will very likely produce the best results. If you include prizes from other brands in addition to your own, you’ll be able to persuade more people to enter your contest, essentially widening the top of your funnel. Step 3: Pick Your Tool. In order to build and launch a successful giveaway campaign, you’ll want to invest in an automation tool. Choose from one of these options: Gleam, Rafflecopter, or ViralSweep. Step 4: Design Your Graphics. Your contest management tool will ask you to upload a few custom graphics that illustrate what your contest is all about. In addition, you’ll also want custom graphics that you can use to promote your giveaway on social media, in blog posts, and in email campaigns. If you don’t have access to a designer, try using Canva. Step 5: Build Your Campaign. As your graphics are being produced, spend time building your campaign in the management tool you chose. During this step, you’ll need to write your contest Terms & Conditions, decide what actions people need to take in order to receive entries, and set your contest start and end date. Step 6: Finalize Your Strategy. Think about how you’ll promote your giveaway when it goes live. Manage everything in a Trello board, create checklists, set deadlines, and loop in other people from your team who will need to help you execute on your plan. Step 7: Pre-Promote Your Giveaway. As you get closer to launching your giveaway campaign, start promoting it on social media, in blog posts, and in email campaigns. Help people understand what prize you’re offering, what they need to do to enter, and when the contest officially goes live. Step 8: Launch Your Giveaway. When everything is ready, launch your campaign through the automation tool you selected. Step 9: Promote Your Giveaway. Promote your giveaway regularly across your marketing channels. Make sure to remind people how easy it is to enter, how great the prize is, and when the giveaway entry period ends. You could also consider creating some paid social ads to promote your contest during this phase as well. Step 10: Pick Your Winner(s). When your contest ends, pick a winner (or winners) and notify them individually through email. Then announce the winners publicly on social media or in a blog post and thank everyone for participating. Step 11: Nurture your new leads. This step is important! Don’t make the mistake of not doing anything with all the new leads you collected throughout your giveaway campaign. Loop your leads into email campaigns, or ask your reservation agents to start qualifying and nurturing them through phone calls, direct mail, and 1-1 emails. If you find that this tactic works really well for you, make an effort to introduce new giveaways each month in order to connect with new leads and give past participants who didn’t win in previous giveaways the chance to win new prizes. Another great way to boost word of mouth is to go on Facebook Live on a regular basis. As more and more businesses start investing in social media, it’s becoming a lot harder to connect and engage with followers. Because Facebook Live is still relatively new, it’s a great way to cut through the noise and grab the attention of followers who are scrolling through their newsfeeds. Do weekly live Q&As with interested travelers and prospective guests. Interview a couple or a family while they’re staying at your resort and allow your followers to ask them questions about their stay. Feature one of your employees every other week and help your followers understand what it is that makes your team special and unique. Give a live tour of your resort and make it easier for people to understand what they’re missing and what they can look forward to. Give a tour of your surrounding area and help travelers understand what events and attractions they can experience while they stay at your resort. Going live on Facebook will help you develop authentic relationships with past guests and prospective travelers, and help you differentiate yourself from other competitors in your area. To get started with Facebook Live, click here. Sending handwritten thank you cards is another great way to boost guest happiness and loyalty. It might seem like a small gesture, but it tends to make a big impact for businesses willing to invest the time, money, and energy into sending personalized letters to every guest who walks through their door. Think about the last time you received a handwritten thank you card from a business you bought products or services from. Has it ever happened? If so, how did it make you feel? Now imagine what your guests would feel if they received a handwritten letter from you, and decide if it’s something you’d like to experiment with at your resort. To boost word of mouth, add a small blurb on the bottom or back of your card asking the recipient to share their card with their friends and family on social media. In exchange, offer a free t-shirt or a gift card to Amazon or Starbucks. You’ll be amazed at how many people take you up on this offer. As mentioned earlier in this post, if you want to get people talking more to their friends and family members about your resort, you have to be proactive about asking for help. Studies have shown that most happy customers would be willing to write testimonial or refer business after a happy experience, but few end up doing so because they are simply never asked. You can get this type of content simply by following up with guests via email a week or two after their stay. Alternatively, you could task your reservation agents with calling past guests and asking them to send this type of content to a specific email address that you use to collect and manage this type of guest feedback (ex. feedback@yourwebsite.com or stories@yourwebsite.com). Make sure to get permission to use any and all content you receive in future marketing material. A simple Google search will provide you with a number of Content Release templates that you can customize for your resort and ask people to sign whenever they send you photos, videos, or stories. Another way to get people talking about your resort is by performing and sharing interviews of loyal guests with your social media followers, blog readers, and email subscribers. These days, online consumers—and online consumers who travel especially—are hungry to consume more storytelling content. You can differentiate from competitors and get people talking about your resort by feeding them original and entertaining stories from past guests who stayed at your resort. Option 1: You can interview past guests in real-time on Facebook Live, as mentioned above in an earlier section. Option 2: You can send text-based questions for guests to answer over email, and create a blog post that features their answers and shares a compelling story with readers. Option 3: You could call past guests and ask them questions over the phone, recording your conversation and producing a podcast-style episode to share on your social media sites and in a blog post. The option you ultimately choose will depend on your time and resources. To find the right guests to interview, make observations while guests are staying with you, get feedback when they check out, or follow up with them a few weeks after their stay. Keep detailed notes about each of your guests and reach out to the ones you think would have good stories to share. Another easy way to drive more word of mouth is to ask questions on your social media pages. Instead of simply posting updates about promotional deals or packages that you’re currently offering, take time every so often to engage in conversations with followers. As each person adds a comment, your reach will extend. What was the best food you ate? What is one thing every traveler who stays with us must see? What traveling tips do you have for people interested in traveling to our area? What unforgettable memory did you create while staying at our resort? What fun stories can you share with us that happened while you were staying at our resort? 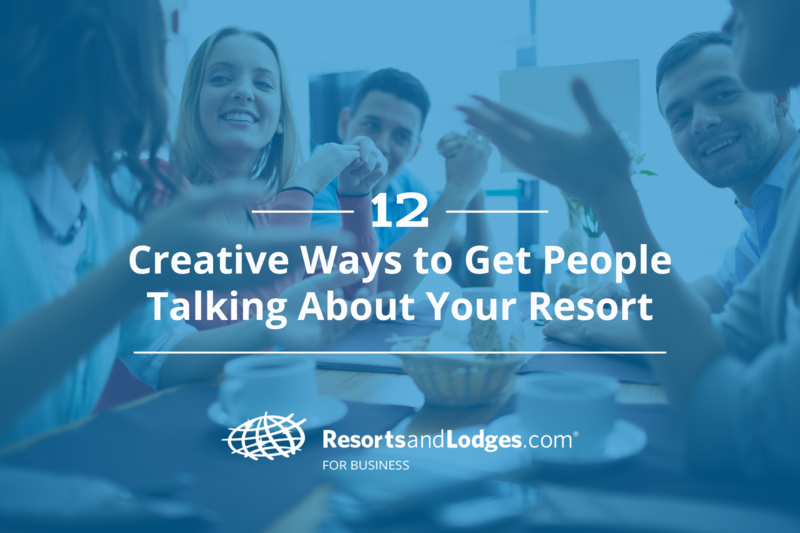 The point here isn’t to be overly promotional about your resort, the goal is simply to spark conversation. In order for this tactic to work, it’s important to remember that you need to engage in the conversation too. Don’t simply ask a question and move on to something else. Instead, read comments that come in from followers and respond authentically to each one you see. It will not only help you build stronger relationships with past guests, but it will also show prospective customers how available you are when it comes to answering questions and communicating with guests. Need blog post ideas? Read this: 85 Blog Post Ideas Every Property Manager Needs. Collaborating with local businesses in your area can also help you get more people talking about your resort. It’s a given that the guests who stay at your resort are also visiting and supporting a number of local businesses in your area. As a property manager, it’s your job to connect with those businesses and gain access to the customers they receive who aren’t staying at your resort. Local businesses can thank you for sending business their way by promoting your resort in their shop or spreading the word on their social media profiles. It’s likely that you already know and interact with other local businesses in the area. As a next step, think of a good collaboration opportunity that you think one business might be interested in, then present the idea to them over the next few months. Think about the ONE thing that makes your resort unique now. If you don’t have one, create one. Then start spreading the word on social media. Get all your guests to experience it and share it with their friends and family members on their social profiles. On a related note, you can also boost word of mouth by simply surprising and delighting guests at every turn. Go out of your way—above and beyond—to create amazing experiences for your guests. Help them feel special and taken care of no matter what they are doing. Call and check in with guests on their second day. Find out if there’s anything you can do to make their stay more enjoyable. The key here is to create memorable experiences that your guests will HAVE to brag about to their friends while they are staying with you, or shortly after they return home. It might seem like a simple tactic, but it can be incredibly effective. Don’t ignore this one! The more people feel like they know you, your team, and your resort, the more invested they will be in your continued success. What else are you doing to get people talking about your resort this month? Share your ideas in the comments below.